I had the privilege and the great fun to have two full-time comedians in my personal life: my dad and my younger daughter. Both Jim and Mack enjoyed life, made the absolute most of each day, and soaked up every ounce of sunshine that came their way. But the rarest human quality shared by this goofy pair was the ability to see humor and fun in the most unlikely of places. When these two characters found humor or manufactured their own, they both laughed from way down deep in their bellies and their souls. While their childlike demeanor sometimes had the capacity to annoy more serious members of their peer group or family circle (like me), mostly, their good cheer was welcome and infectious. There were many, many reasons why his family and friends called my dad Frisky, because he had more energy than a classroom full of kindergarteners, always bouncing, cackling, teasing, and making a competitive game out of the most ridiculous activities. One time when we were visiting him in southern Missouri, where he had settled into quasi-retirement, he greeted my girls with one of those 100-count boxes of colorful, tubular popsicles. He immediately began encouraging Savannah and Mackenzie to consume them two or three at a time; but, of course, just eating them was not enough. At some point in our weekend visit, probably late into the night after hours and hours of playing cards and consuming horrifying quantities of Hostess Ding Dongs, Doritos, and Pepsi, he organized a tasting game out of those damn frozen treats. He sorted them out, prepared bundles of every color for each one of us, and then conducted a blind taste test. We were all charged with tasting each color—red, green, orange, yellow, and blue—and with reporting the flavor of each, while blindfolded for added drama, of course. Jim made a great deal of fanfare over the entire test, dragging it out and providing lively, running commentary, carefully recording the results and, in the end, declaring a winner. I have no memory of who won, but I can tell you that we all laughed and laughed and ate way too many popsicles. 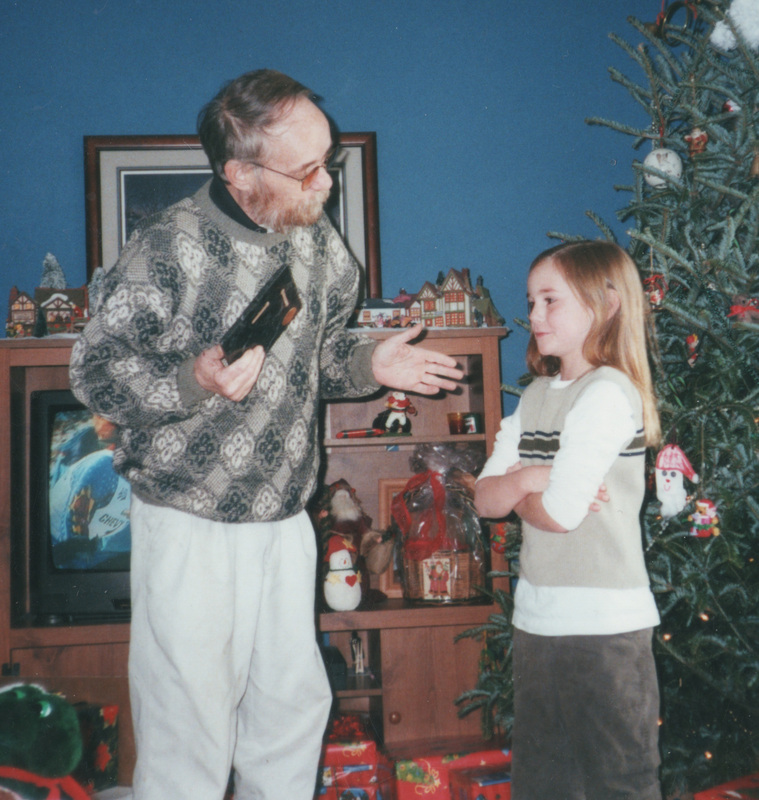 My kids always remembered that silly experience with their silly grandfather; and, I am certain, such interactions with my dad made a deep impact on my little Macko. Unfortunately, my kids had little time to know my father, as he died too young in 2001. I adopted some of his humor, and I have a penchant for various childhood delights (like cartoons, Disneyland, merciless teasing, and popsicles), but I turned out to be far too serious by Jim Pratt standards. Therefore, I am pleased that he was able to see some of his sunny perspective and humor in Mack; and had he lived longer, he would have been happy and proud to see how much like him she would ultimately become. Because somehow, either through genetics or that short seven years that their lives overlapped, Mack got the silly, happy, laughing genes of my father. Whenever she was chuckling over stupid jokes, badly singing a ridiculous song she had composed on the fly, or compelling her family members or friends to participate with her in a Mackified handshake or a made-up game, she reminded me so much of him…those sparkling brown eyes, all those freckles and that impish sense of humor. As I continue to reflect on Mack’s good life and celebrate her character and qualities, I have begun to see much more clearly the connections between these two important people in my life. My dad would have been seventy-one this week, and as has become my custom, I will on his birthday enjoy a Pepsi, a beverage for which his love was legendary. But this year, without Mack to share that Pepsi and swap some crazy Grandpa Jim stories, I want to tell one of Mack’s favorite tales. No doubt she enjoyed this one partly because it reflected so well on her football knowledge and her Irish luck, but also because it was one she vividly recalled and for which she possessed a tangible memento. Jim Pratt preferred that his family members share his devotion to the NFL; but he required them to participate in the Pratt Family NFL Football Contest Pool whether they loved football or not. While he let some family members, like my mother and my husband, mostly off the hook, all others were compelled to partake. Even girly little Savannah, who made her picks based upon the likability of the team mascots, enjoyed the fun. For years, my dad would call everyone up each week and record their picks in his Pratt Book of World Records (a ragged notebook smeared with the colorful felt-tip ink he always used). Bragging rights were the only reward for being a weekly or a season winner, yet we all trash-talked and fussed as if serious money was at stake. Mack was particularly good at the trash-talking, but she backed up her sass with an impressively accurate pick record. Not at all surprising, really, because she dutifully compared team records, assessed strengths of schedule, and evaluated injury reports before making those weekly picks; and her methods yielded frequent bragging rights. 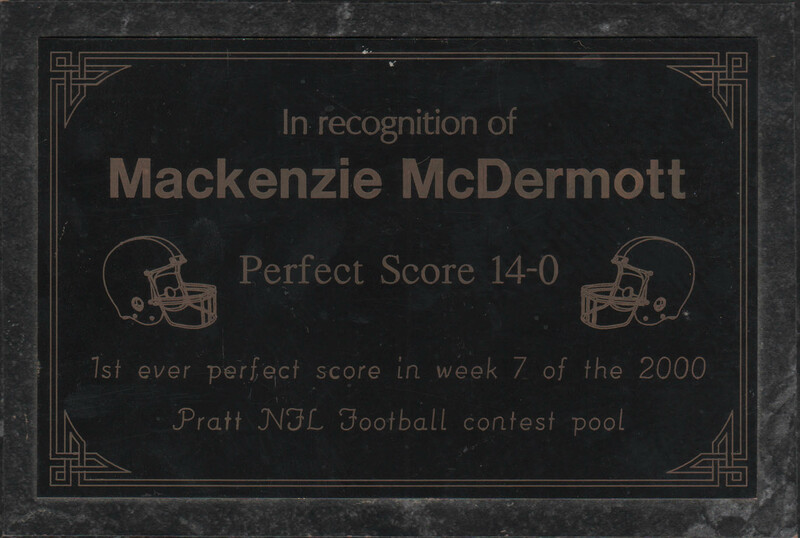 In Week 7 of the 2000 NFL season, Mack did what no other person in the history of the Pratt Family NFL Football Contest Pool had ever done. Not my dad. Not me. Not anyone. That week, four teams were idle, but twenty-eight teams played fourteen games. Mack did her homework, selected her winners, and on October 19, after the Tennessee Titans defeated the Jacksonville Jaguars on Monday Night Football, she had accurately picked every winner. My dad was over the moon. He went nuts. He believed this may have been the single best Pratt family accomplishment EVER, and he decided it deserved much more than bragging rights. So at Christmas that year at my sister’s house, he orchestrated a mini award ceremony in front of the Christmas tree. He delivered a rousing speech, attesting to Mack’s impressive skills and the unworthiness of the rest of us slugs to compete in the same league with her. And with a great deal of drama, he presented Mack with a plaque, professionally engraved, recording her astounding achievement. Now I ask you, is it really any wonder why Mackenzie was the happy goof that she always was? I think not. No doubt Grandpa Frisky had an important role to play in that youthful spirit that made my Macko so fun and so unique. ← What?!! All this for ME? That was beautiful. He was a goof ball. He loved his sports. Great blog Stacy. Rest assured, Frisky & Macko WILL be watching the NFC & AFC championship games AND, of course, the Super Bowl — together!